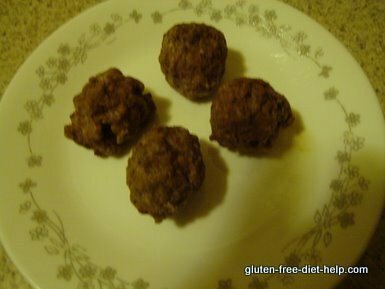 For a great gluten free meal make your own juicy, tasty meatballs. Use them for spaghetti or any meal you want! They freeze well and can be made ahead of time for use at your own convenience. 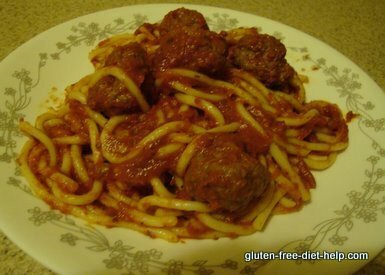 Make several batches of this easy gluten free recipe and freeze for a quick, time saving dinner. Then just put the frozen meatballs in your favorite sauce to heat them up together. In a small glass bowl, put the 2 teaspoons of Italian Seasoning. Pour the boiling water over the spices and let them rehydrate. Allow to sit about 10 minutes. In a large bowl, put the ground beef, salt, garlic salt, and black pepper. Mix well. Add in the Italian Seasoning, including the water. Mix all thoroughly together. Work in the mashed potato flakes and egg if using. You will need a cookie sheet with low sides. Take about 2 Tablespoons of the meat mixture and shape it into a ball. Set on cookie sheet. Space them at least an inch apart. Continue until all meat is shaped. It should make approximately 50 meatballs. Bake at 350 degrees for 30 minutes or until center is fully cooked. Cut one of the largest in half to make sure they are done. There should be no pink showing at all. Freeze the extra meatballs in a marked, dated freezer bag. They will hold for about 8 weeks. Cool completely before freezing. These are very versatile, and can be used with most sauces. Simply add them to the sauce as you are heating it. Let sauce simmer at least 5-10 minutes to ensure the centers of the meatballs are thoroughly heated. If you can make a double recipe on a weekend, you will have 3-4 dinners worth of gluten free meatballs for use during the week. Most children love spaghetti, and I think most adults do too. It is an easy meal to put together quickly with a salad or some canned or frozen green beans. For a busy mom, it can be a nice weekly meal. Gluten free pasta is available at Whole Foods, Wild Oats, Sprouts and some major grocery stores. Fry's/Kroger/Meijers often have a gluten free section.